In the TPS Principles and Practices discussion group on LinkedIn, Brian Miller initiated a discussion on “How do you create standard work for a customized product that has over a billion combinations?” It has had 31 comments so far, and I would like to share here a few that I made. Even in a plant that is perceived to be focused on low-volume/high-mix production, you usually have an uneven demand pattern, calling for different approaches to standard work by product category. You start with a Runner/Repeater/Stranger analysis to determine what it is we do often and what not. Without this analysis, we commingle in the same lines products made every day with other products made sporadically (See Lean Assembly). In Japan, this is called P-Q, or Product-Quantity analysis, with the categories called A, B and C. The more vivid Runner/Repeater/Stranger terminology comes from Lucas Industries in the UK. You then use a dedicated, integrated production line for each Runners, a flexible line for each family of Repeaters, and a job-shop with functional groupings of equipment for Strangers. 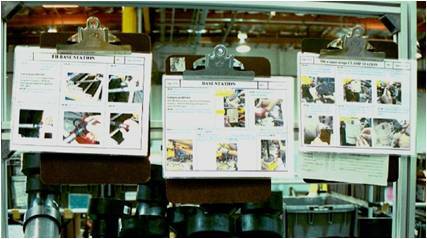 In a runner line, you can post A3 sheets above each workstations with instructions for the purpose of allowing supervisors to monitor how the work is being done. This is the normal situation of high-volume production.The operators themselves do not need to read the instructions for every workpiece; as soon as they are proficient in the job, they work from memory. A repeater line is for a family of products with variants but with a high commonality of materials and processes. The instructions that can be posted on A3 sheets are then limited to the common processes, but the operator needs to read what is specific to each workpiece. 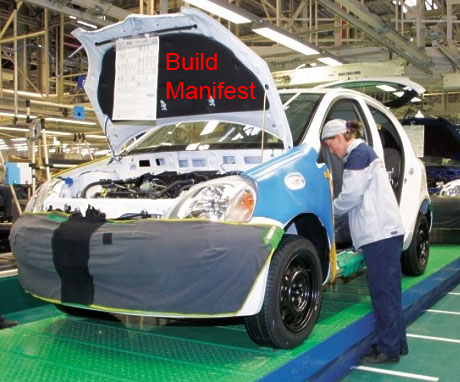 For final assembly of cars, Toyota has provided “build manifests” printed on larger sheets mounted on car bodies and bearing all the option information. The kitting of workpiece-specific components also helps. In computer assembly, workpiece specifics are shown on electronic displays, with component picks validated by auto-ID technology, including bar codes, QR-codes, or RFID chips. Strangers are the odds and ends with sporadic demand, one-of-a-kind systems, or new product prototypes. For strangers, you cannot rely on operator memory or habit. 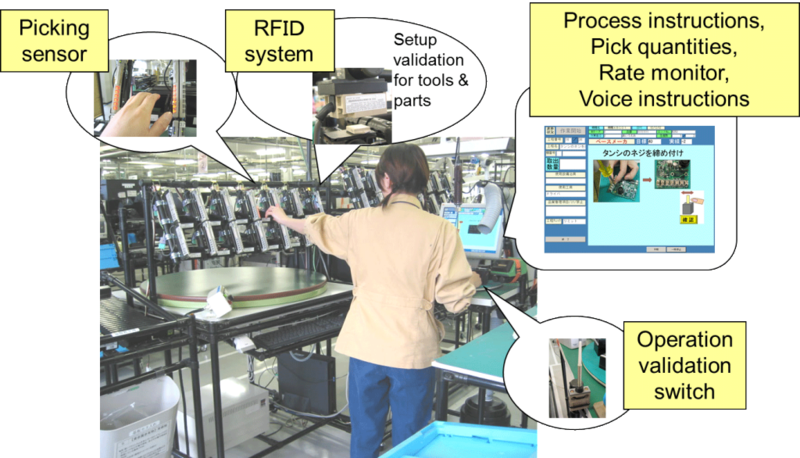 For one-of-a-kind systems or prototypes, you cannot even assume you have the knowledge needed to produce workable detailed instructions. Each stranger is a job in a job shop and requires instructions on a traveller that moves with the workpiece. The traveller may be hardcopy or electronic. An electronic traveller may either be a device containing all the instructions or an ID that triggers the download of appropriate instructions at each station. Strangers are usually built by skilled craftsmen able to work directly from engineering drawings. Given the nature of strangers, however, the time required cannot be precisely known and sequencing mistakes will happen, making rework inevitable. 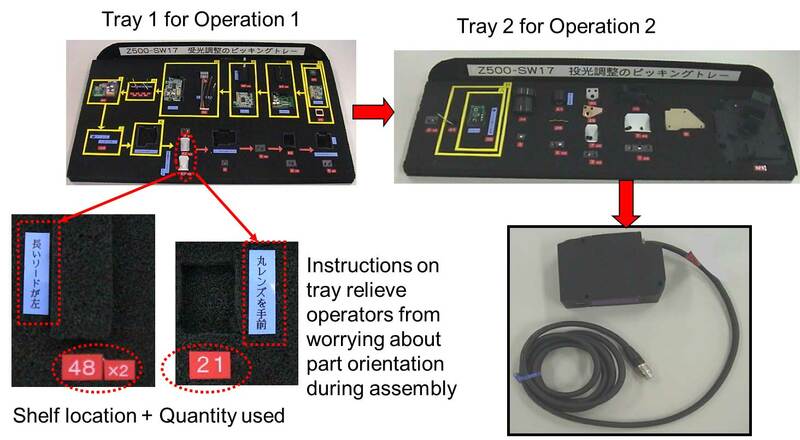 Seeing that your sample photo of a stranger assembly station has a computer in it, social collaboration software could be used to further improve the work instructions of stranger parts. For example, the work instructions could reside on a wiki platform and the operator could improve the instructions there as he works. These notes would then be available to whoever works on that particular part the next time one is manufactured. I know of a job shop in Finland that operates on this model, but that case study is only available in Finnish as far as I know ( link to Reifer CEO’s presentation slides on this, photos on pages 7 and 9 should make sense even if the language doesn’t: http://www.teknologiateollisuus.fi/file/13263/Reifer_Lassi_Otranen_15022012.pdf.html ). Yes, the presentation in Finnish is hard to follow, for those of us who have not had the opportunity to learn this language. On this blog, there is also a post on a project at Schlumberger to provide operator instructions on iPads, accessed through QR scans, and managed through InfoPath on a Sharepoint site. I think standard work is probably more important for tasks that are done infrequently to avoid memory lapses or (mental) process overlaps that you might have. Having the correct instructions, tools and parts reduces the likelihood of getting it wrong. The “Billion” parts is scary… But less frightening if we started documenting properly at the outset and expanded our documentation with each new development. It does become a massive paper trail, even just keeping bills of materials up to date as revisions change. In healthcare standard work and work standards are key yet so many people are adverse to them. I’m trying to shift that mindset! Rather than write a novel on Standard Work take time to study TWI because the answer is there. It was GI Joe that won WW2 it was Rosie the riveter and TWI. I work in the machine shop for aircraft engine repair and overhaul shop. It is all one piece flow. For some preparatory machining operation a determination of some kind has to be made on what has to be done. Parts are done on as needed basis and we don’t know what they are until they arrive. Despite all this we can turn a machine round in under ten minutes. Yes, TWI was wonderful and its concepts are still relevant, but it has been almost 70 years since the end of World War II, the field has not been standing still, and we have a few technological gadgets to play with that the developers of TWI didn’t. My understanding of TWI’s Job Instruction is that it is primarily focused on initial training, taking people with no prior manufacturing experience and enabling them rapidly to function in a factory setting. Standard Work, on the other hand, is about ensuring that every operation is executed the same way every time, until the next improvement. It is control function rather than training. We also produce in a Low volume, High mix environment and we have hard copy ‘lot travelers’ which follow each batch in production. The SOP states ‘how to select a program on the machine’, while the lot traveler states ‘what program to select’.